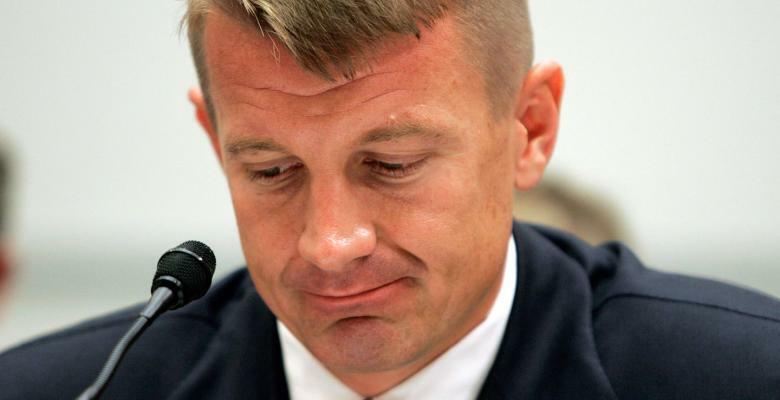 A leaked memo revealed details of a secret meeting between Blackwater founder Erik Prince and allies of Russian President Vladimir Putin. The New York Times reported that Prince, a supporter of President Donald Trump and the brother of Education Secretary Betsy DeVos, attended a secret meeting in the Seychelles with a Russian fund manager. The meeting was organized by George Nader, an adviser to the leader of the United Arab Emirates. The meeting between Prince and Kirill Dmitriev, who manages a Russian sovereign wealth fund and is believed to be close to Putin, took place on January 11, 2017, just weeks after Trump's son-in-law reportedly told the Russians that he wanted to set up a back-channel between Trump and the Russian president. Prince denied attempting to set up such a back-channel in sworn testimony to Congress. He claimed that he traveled to the Seychelles for business and unexpectedly ran into Dmitriev. But Nader, who is cooperating with special counsel Bob Mueller's investigation, reportedly testified to the grand jury that the meeting was “an effort to establish a back channel between the incoming administration and the Kremlin,” according to The Washington Post, which added that Mueller has additional evidence to corroborate the claim. On Wednesday, The Daily Beast obtained a memo from Dmitriev shedding light on what the two discussed. The memo includes such topics as setting up joint U.S.-Russian raids to go after wanted terrorists, having an American government agency work with Dmitriev's sanctioned Russian fund, and for Moscow to invest large sums of money in the Midwest. Prince has publicly supported closer U.S.-Russia relations on terror. The point appears to go straight to the heart of Trump's economic message of bringing manufacturing jobs back to the Midwest. Prince, who could face federal charges if it can be proven he lied about his discussions with Dmitriev, insisted through a spokesperson that he is standing by his story. “Mr. Prince told The Daily Beast everything there is to say when he interviewed in June, nothing has changed,” a spokesperson for the billionaire told the outlet. Obama Pentagon official Evelyn Farkas told The Daily Beast the points in the memo mirror repeated Russian proposals that previous administrations were uninterested in. Rep. Jim Himes, a Democrat from Connecticut, went a step further. “This just feels to me like one more of the half-dozen examples of Russians sticking their tentacles out to see what kind of relationships they might build, what kind of influence they might have,” he said.